Wow, long time no see! I have been majorly slacking on the blog posts recently, but I have had so much going on with finishing my Master’s degree that blogging was the last thing on my mind. Now I’ve finished my Masters (apart from one more assignment), and last Friday I celebrated in the most amazing possible way by heading to London to see Taylor Swift! I’ve been a fan of Taylor for around ten years, and the last time I saw her was three years ago and we were right up in the top tier. It was an incredible show but I was super excited this time to actually be able to see her up close! When I first bought my tickets, we were in the first tier of seating, but a few months ago I managed to upgrade my tickets as they released some of the floor seats at the same price that I had paid, so I went from being in tiered seating to having ninth row seats on the pitch! When we walked into Wembley Stadium I was truly awe-struck. Walking down the steps I looked around and I was honestly speechless at the sheer size of it. I’d never been to Wembley before and it certainly was a lot to take in, I actually almost felt like crying it was that breath-taking. Even though I knew we were going to be close, when we got to our seats I felt like I was going to burst with excitement because we were SO CLOSE. The support acts, Charlie XCX and Camila Cabello, were really good and hyped up the crowd so much ready for Taylor to come on. What I loved was the fact that there wasn’t much waiting around, there was only about fifteen minutes in between the two support acts and then about 15/20 minutes between Camila and Taylor. There was a video shown on the big screens in the build-up to Taylor coming on which were super clever. They showed clips of Taylor throughout the years with a voiceover of news reports about her, all the negative things that people have said and kept repeating the word ‘reputation’ until it became a blur of just that word. I thought this was such a cool and well thought-through opening because it showed that this new era of Taylor’s career and music is her breaking free of all the negativity and drama of the past and not caring about what people say about her. ‘Ready For It?’, the most apt opening song for a concert ever, blared out of the speakers and straight away I couldn’t believe the power of the acoustics in the stadium. The beat boomed throughout the whole place and the atmosphere was electric from the word go. When Taylor came out I still couldn’t quite believe she was right there in front of us! We were in front of one of the smaller stages at the end of a walkway which she came down a lot, which was amazing! Also because we were so close I had a perfect view which is so rare for me because I’m so short! Taylor seamlessly went through the next two songs, ‘I Did Something Bad’ and ‘Gorgeous’, constantly talking to the crowd in between and thanking us for being at her first ever headline show at Wembley Stadium. You could tell how much it meant to her, and her happiness and energy shone through as I jumped and danced along with her and everyone else in the stadium. Before the first costume change, she sang three older songs which I absolutely adored. She went from ‘Style’ into ‘Love Story’ and then ‘You Belong With Me’. ‘Love Story’ was the first ever Taylor song I heard and it was what made me fall in love with her ten years ago and decide to buy her album and I’ve never looked back since! Hearing it live was incredible and everyone was going crazy in the crowd. During ‘You Belong With Me’ absolutely everyone around me was full on jumping to the beat, including me, it felt like I’d done a workout and we were only fifteen minutes into the show! I honestly already felt on cloud nine such a short time into the show, it was an indescribable feeling. 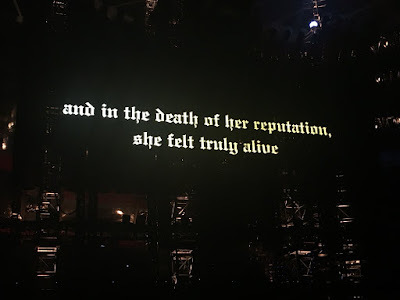 There was another video interlude while Taylor went off stage for a costume change, and when the screens parted and she came back out there was a really cool golden platform type thing that moved from side to side sort of like a see-saw, which her dancers and her danced on throughout ‘Look What You Made Me Do’. Also, in the gap between the screens a huge snake started emerging, which was so impressive! Taylor’s stage setup and visuals are always out of this world and make the show a cut above your average concert. She then sang ‘End Game’ and ‘King of My Heart’ before making another cute speech about how you shouldn’t let what other people say about you define you, because that’s not who you are, it’s who people think you are. Hearing her say those words always really inspires me because I’ve looked up to her since I was just 13 years old. I know some people dislike her, but I truly think if you went to one of her shows and watched how much passion she puts into her performances and how heartfelt she is when she speaks, you truly would change your mind. To me she is one of the most inspirational women who I am proud to say I have admired for all of my teenage years and beyond. After this, she stepped onto sort of a light up platform thing that looked like twisted fairy lights as she began to sing ‘Delicate’. The platform lifted up into the air and she literally flew right above us as she made her way to the B stage! She was waving out at the crowd as we all waved furiously at her (I’m just gonna pretend she waved at me) and she honestly looked like an angel as she glided through the sky. On the B stage she welcomed Charlie XCX and Camila back to the stage to sing ‘Shake It Off’ with her. Because the B stage was quite far away from us, we couldn’t see her at all when she was over there, but by God that didn’t stop us from having a party! I’ve honestly never seen anything like it. Everyone around us was properly dancing along; old and young, couples, two little girls were dancing next to me holding each other’s hands and spinning around with the hugest smiles on their faces. Just thinking about it gives me goosebumps because in that moment I thought you know what, maybe this world is a much better place than it seems. Maybe there is still happiness to be found. Dancing and looking around I couldn’t stop grinning at all these people who were having the absolute time of their lives and I thought wow I wish I could bottle this feeling because I simply cannot put this level of happiness into words and everyone deserves to feel it. 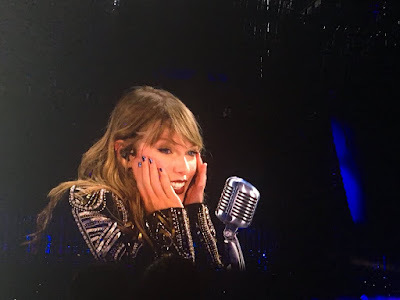 Taylor then did a beautiful acoustic version of ‘Dancing With Our Hands Tied’, and then sang ‘So It Goes…’ as a surprise song, which was the first time she’s ever sung that song live! She then walked through the crowd to the B stage on the other side, touching people’s hands as she went along which was so heart-warming. The smile on her face as she tried her hardest to touch everyone’s hands was so endearing. She sang ‘Blank Space’ and ‘Dress’ on the other B stage before flying back to the main stage to sing a mash up of ‘Bad Blood’ and ‘Should’ve Said No’ which was one of my favourites. However, the next part of the show after another costume change was my absolute favourite part. ‘Don’t Blame Me’ was honestly the closest thing I think I’ll ever get to a religious experience. I have always got so hyped listening to that song and imagining how incredible it would be live but nothing could prepare me for just how insane it actually was. It’s just the most perfect hands in the air, belting out the words without a care in the world song. After the complete hype of that, she sat down at a piano and this was the part where I lost control of my emotions. She started talking about how she was so grateful to all of us for sticking with her while other people were turning against her and causing drama, and then went into singing my absolute favourite song in the entire world ‘Long Live.’ I remember listening to this song as a young girl and just adoring the words. It’s all about someone finally achieving their dreams and looking back and saying wow, I did that. I always used to think that I wished I would do something in the future that would make me feel that way. Taylor’s music was always a comfort to me, a reassurance that someone understood what I was going through and put it into words better than I ever could. It made me feel like I wasn’t alone. To hear ‘Long Live’ at a time when I’d just finished my Masters, when I had come so far since even this time last year when I was having so much anxiety and didn’t ever see it going away, meant so much to me. I thought, younger me if you could see me now you would be proud. And I wish I could go back and tell her that there was nothing to worry about because I finally did something I could be proud of, and I became someone who that girl would never have believed I could become. I must admit I sobbed because all my emotions overwhelmed me and the lyrics to the song were just so perfect and fitting. Long live all the mountains we moved. She then went from ‘Long Live’ into a mash-up with ‘New Year’s Day’, which is also an emotional song that always gives me goosebumps. I should also mention that we were all given wristbands as we went into the stadium which lit up different colours and flashed to the beat of each song, and Taylor said it was so that she could see every single person in the stadium. During this mash up there was just a sea of purple/blue lights and it was just as the sun was going down and it was getting dark, the atmosphere was beautiful. and the entire crowd screamed and cheered, and her face was just the picture of happiness. She stared out at the crowd and as her smile got bigger and bigger the applause and screams grew louder and louder. It honestly went on for about five minutes, and Taylor looked so overwhelmed and shocked that everyone was cheering so much for her. She kept mouthing ‘oh my God’ as if she couldn’t believe the amount of love she was receiving. To see her like that, so happy and grateful and in disbelief that we would appreciate her like that, was truly just so amazing. I wish I could’ve frozen that moment and that feeling because if everyone could witness it, they would see why Taylor is such an incredible person. She went on to say that she had never felt as happy as she did in that moment, and to have been a part of that is one of the greatest things I’ve ever experienced. Moments like that make you believe that all is not lost. After another costume change, Taylor came back out for the last time in a glittery purple dress and sang my favourite song off ‘Reputation’, ‘Getaway Car’. She came so close to us during the song and it was so amazing to hear it live! Then something happened which can only be described as jaw-droppingly insane. Taylor said she wanted to welcome a guest to the stage, and she only went and brought out NIALL HORAN. Two of my favourite people on the stage together?? PINCH ME. I think you can imagine my reaction when Niall came out. I screamed at the top of my lungs and almost fell on the floor and was shaking so much. They sang ‘Slow Hands’ and honestly it was one of the single greatest moments of my existence. I can’t believe how lucky I am to have seen two of my favourite artists together when I was only expecting one! Even though it almost gave me a heart attack and left me with an extremely sore throat the next day, it was such an incredible thing to see. The show ended with an epic mash-up of ‘We Are Never Getting Back Together’ and ‘This is Why We Can’t Have Nice Things’. This was the most perfect ending and an incredible finale to the most amazing show. There was an actual working fountain on stage, fireworks to the beat of the song and just so much energy to end the show on a high. Confetti fell from the sky, which was little newspapers printed with the words ‘Taylor Swift’ all over them. It was honestly the best ending song and left everyone dancing and singing as they left the stadium. I hope I’ve managed to put across how indescribably amazing this show was. Taylor’s vocals were on point as always, she never let up her amazing energy and her happiness shone through every single moment. I am so grateful that I got to see one of my idols so close to me in Wembley Stadium. I felt like I was on a high all night. The show lasted for two whole hours and the production, staging, dancers, everything was perfect. I hope you enjoyed this post if you made it this far! Have you seen Taylor live? If you have, what was your favourite song or part of the show? I would love to hear from you in the comments!